Free outdoor dance classes are returning to Downtown San Jose. 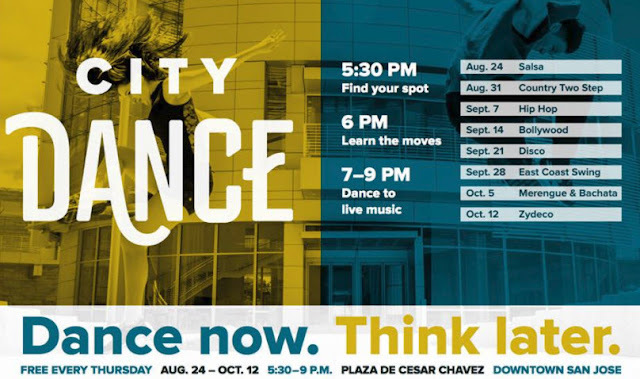 Every Thursday between August 24th and October 12th, a different genre of dance will be taught at Plaza de Cesar Chavez. You have everything from Salsa to Hip Hop to Disco. Even Bollywood and Zydeco are on the list this year. Classes begin at 6pm and the lessons go for about an hour. Then between 7-9pm you can practice what you learned to live music. All are welcome and again, these classes are completely free. If that isn't enough to entice you, there will also be a beer garden and street food. For more info, head over here.